Indiana Beer Barons: Pilates and Yoga and Beer- Oh My! I'm going to guess that the title of this post includes things that you normally don't think of as all going together. While you may be right most of the time, this Saturday they definitely go together. I've had the opportunity to attend classes and individual sessions at Reforming Indy pilates studio and I have to say I'm a huge fan. It's hard work, but the instructors are awesome and they make even the hard stuff fun. If you can make it to this event you're in for a treat. The Big Guy and I will both be there, for the classes and for the tasting. A girl's gotta do something to burn off those craft beer calories, right? 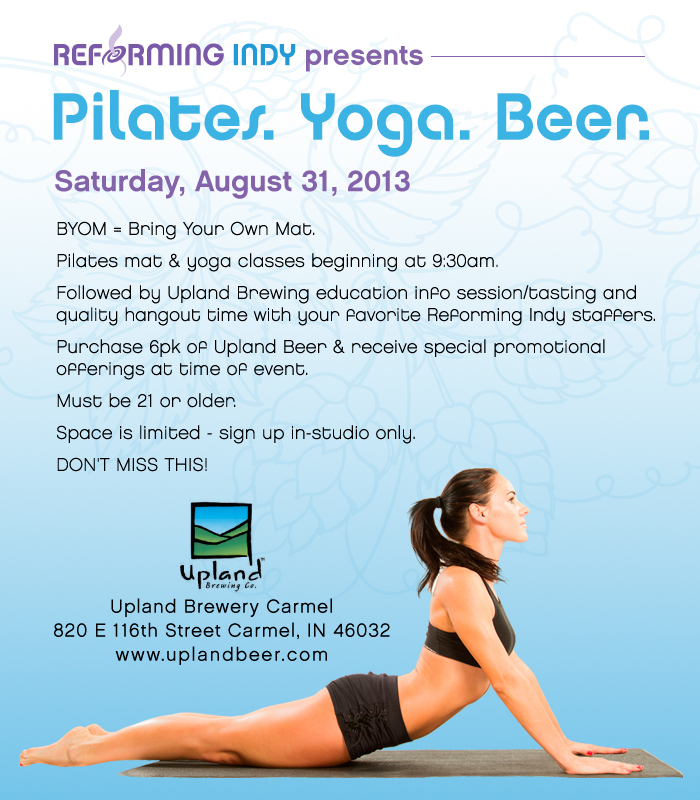 If you have questions about the classes or the event as a whole, please call Reforming Indy at 317.571.8880. I hope to see you there!